Sean Penn stars in ‘The Gunman.’ Photo Credit: Open Road Films. From Taken (2008) director, Pierre Morel, his latest action-drama, The Gunman is primed with top notch actors, Sean Penn (The Secret Life of Walter Mitty, 2013), Idris Elba (Luther, 2010-2015) and Javier Bardem (The Counselor, 2013). Loosely based from the 1981 novel, “The Prone Gunman” by the well-known French crime writer Jean-Patrick Manchette, this film is rather slow at first, but picks up the pace about 40 minutes into viewing. While audiences may typically be used to the awe and legendry of Liam Neeson from the Taken series, they will quickly realize his absence in this film as he is simply incomparable. Penn (who also co-wrote the script) plays the main character Jim Terrier, who’s an armed defender for a humanitarian organization in the People’s Republic of Congo, but also a secret special operative for hire. Early on, he assassinates a prominent government official and is immediately wanted. He must not only flee Congo, but also his girlfriend Annie (Jasmine Trinca, Saint Laurent, 2014), leaving his identity behind. Eight years pass and Terrier has returned to Congo to help the locals by digging wells for a non-governmental organization (NGO). Despite his time away to regroup, his post-traumatic stress disorder continues to eat away at him. He becomes even more paranoid after he’s attacked by three hooligans who have been sent to kill him and bring back 50 cc’s of genetic proof of his murder. He travels to London to try and track down his former partners, but instead discovers they’ve taken on new ventures. Initially, he suspects Felix (who is conveniently now married to Annie) as the one behind the move, but soon other clues lead him to believe it could be his ex-boss, Cox. Unfortunately, the film doesn’t quite hit the bulls eye, but it’s worth a shot as the various settings behind the non-stop action – from Africa and London to Madrid and Barcelona- are worth the watch. Morel certainly concentrates on the set in The Gunman. The shootouts, high speed chases, knife fights and climactic foreshadowing at a bullfighting ring are all effective and entertaining; it’s just too predictable and unoriginal. His comrades Felix (Bardem), Cox (Mark Rylance, Days and Nights, 2014), Stanley (Ray Winstone, Snow White and the Huntsman, 2012) and Barnes (Elba) are all respectable as his supporting men. Trinca’s presence helps balance the film by removing a little testosterone in each of her scenes. (It won’t take long for audiences to realize that Penn hasn’t missed a day at the gym. The incredibly tan and muscular 54-year old sheds his shirt at any opportunity.) While Annie paved her way as a humanitarian, she still plays the token ‘damsel in distress’ role during her underdeveloped romances. She’s submissive and jockeyed back and forth between Felix and Terrier. One aspect of the film that seemed like a cheap add-in was Penn’s supposed ‘brain damage’ from earlier combat. This concept seemed too easy to weave into the plot. His condition seems to be emphasized in the beginning, but then fizzles out. It’s almost forgotten by audiences…until Terrier’s symptoms reappear when it’s necessary for the villain to escape. Bottom-Line? The Gunman is an entertaining action-thriller with top notch actors Sean Penn, Irdis Elba and Javier Bardem who make the film worth it, despite its misfire in the storyline department. 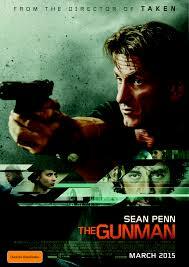 This film is not Taken caliber, but a good ramp up to the stereotypically better action films this summer.